About the National Association of Online Investors - NAOI - and its Investor Education Division and Investment Research Division. The NAOI is the nation's leading provider of objective investor education. The National Association of Online Investors (NAOI) is the nation's premier investor empowerment resource. Founded in 1997 by President Leland Hevner, the NAOI has as its mission the empowerment of average people to make more effective and profitable investing decisions and to take more personal control of their financial futures. The NAOI accomplishes this goal via education and innovation. 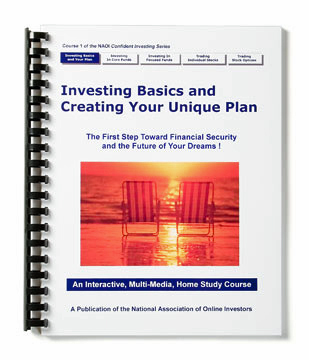 The NAOI has taught thousands of individuals how to become better investors. Recently we expanded our investor empowerment mission to include research and development with the goal of developing new investing methods and investment types such as Dynamic Investments. We added the Investing Research Center Division to our corporate structure for this purpose. In 2015 the NAOI officially split into two Divisions as shown in the organization chart below. The original NAOI consisted of just the Education Division. The new NAOI has expanded to include the Investing Research Division. The Divisions are subdivided into Sections as illustrated below. Refer to the Research area of this site for more specific information related to our Investing Research Division. The core product of our investor education product line is the "NAOI Individual Investor Certification Program". Unique in the industry, this program consists of five individual courses that are scrolling at right. Each book is a standalone course that can be taken without the need to complete any of the others. However, for a person who seeks a comprehensive education on how investing works we suggest that the entire Program be completed and the NAOI Investor Certification earned. NAOI courses are dynamic. Each course has an online component that contains interactive resources such as calculators, worksheets and links to relevant Web sites. The online component also enables us to keep our course content current at all times. In addition, the NAOI performs a comprehensive review of the total Program on an annual basis and changes the hardcopy content as needed. Graduates of the NAOI Certification Program have told us that this is the objective, comprehensive and action-oriented resource they needed to become more effective investors and to take more personal control of their portfolios. While program graduates are fully capable of investing on their own, most still decide to work with a financial adviser. But as a graduate of this Program they no longer simply accept investment recommendations without question. NAOI Certified Individual Investors are able to analyze any advice given to them and to challenge it if necessary - and it usually is. Note that the Certification Program is currently undergoing major revisions. When changes and additions are completed it will be available in the online store of this site. Sign up for our Update Alerts email list at the bottom of any page on this site to be notified when it is available. Having spent over a decade teaching the public how to invest, the NAOI has created several very valuable assets. These are assets that we can make available to any financial service organization who is looking for a significant competitive edge in a crowded market. The most valuable are listed below. Our Investor Education Knowledge Base Asset - From years of developing educational course content and constantly refreshing it with student feedback, the NAOI has developed an incredibly valuable asset in the form of our Investor Education Knowledge Base. 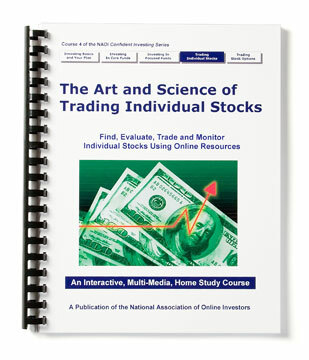 Consisting of over 1000 pages of material covering a full range of investing topics, the NAOI is able to use this resource to create customized education courses for financial organizations effectively and efficiently. Our students tell us that any organization, or financial advisor, offering objective investing education will stand head-and-shoulders above their competitors. Our Market Knowledge Asset - The NAOI has worked closely with average investors for over a decade. We know their wants and needs. We know their hopes and fears. We know what works for them in the investing world and what doesn't. And we know what they need from financial organization that they are not now getting. This knowledge along with our direct connection with the investing public on a continuing basis is a valuable asset that we can use to assist any financial organization in better meeting the needs of the public. We can show any vendor of investment products and/or services how to increase revenues exponentially by better understanding the investing public. Our "Credibility" Asset - There is a growing confidence gap between the public and the financial services industry today. This gap widened during the crash of 2008 as advisors told people to simply hold their portfolios as their value melted, sometimes by as much as 50%. As a result, many people left the market vowing to never return. The NAOI can close this confidence gap and restore trust with financial organizations who work with us to improve and supplement their current offerings with investor education. We are recognized by the public nationwide as an honest and objective player in the world of investing. We have nothing to sell but education and investor empowerment. Any financial organization that associates itself with the NAOI immediately gains the credibility that the public is looking for today. A financial organization can take advantage of these three assets and others via an NAOI Partnership . We can quickly and efficiently create customized education programs for any organization that sells investing products or services to the public. And we can consult with organizations to align their products/services with the wants and needs of the public. NAOI research shows that the top benefit that individuals want from a financial vendor is a first-class education offering. This the NAOI can provide. Use the Contact Page to start a conversation of how your organization can gain a massive competitive advantage by working with the NAOI. With the creation of the NAOI Investing Research Center we have greatly expanded the scope of our assets and offerings. we have added to our comprehensive investor education the capacity to develop innovative investing approaches and unique investment types as demonstrated by the creation of Dynamic Investment Theory and Dynamic Investments. These developments represent astounding improvements to the very core of how we invest today. And only the NAOI is able to provide the quality education needed to enable the public to understand and use this new approach with confidence. The combination of innovation and education makes the NAOI unique in the field for both empowering investors and for enabling financial organizations to expand their offerings, open new revenue streams and gain massive competitive advantage.